Paul Revere's Pizza kitchens combine quality ingredients and toppings with high standards of preparation and cost control to assemble our fresh prepared menu items. 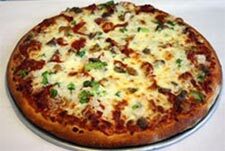 Paul Revere Pizza offers our customers the ultimate in convenience - Fresh, Hot and FREE delivery. While the majority of our customers take advantage of our delivery service, we also provide convenient carry out at all of our stores with dine in facilities at select locations. Paul Revere's Pizza kitchens combine quality ingredients and toppings with high standards of preparation and cost control to assemble our fresh prepared menu items. Paul Revere Pizza construction and build out costs are comparatively low because our restaurants are designed to use existing spaces and buildings. Our kitchens need relatively low square footage area (approx 1000 - 1200 sq. ft.) because Paul Revere Pizza specializes in delivery & carry out operations. Delivery/carry out locations require fewer employees and space than a full service dine-in establishment, which results in lower labor and lease expenditures. Lower initial build out and construction costs, small required square footage and fewer employees result in substantially reduced initial investment and ongoing overhead costs. With Paul Revere's Pizza you will not ride alone. We have developed a successful formula for store operation and we'd love to share it with you! Franchise trainers will share their knowledge and experience - you and your employees will learn how to make, bake and deliver Paul Revere Pizza's menu using our time tested systems and operations. A comprehensive Operations Manual is used during the training process to instruct management and employees on product preparation, cost control, food safety, cleaning, sanitization and more. Franchise representatives with years of restaurant operation experience developed our systems to build a successful franchise, and you can be the beneficiary. To learn more about the Paul Revere's Pizza franchise opportunity, simply complete the form below.